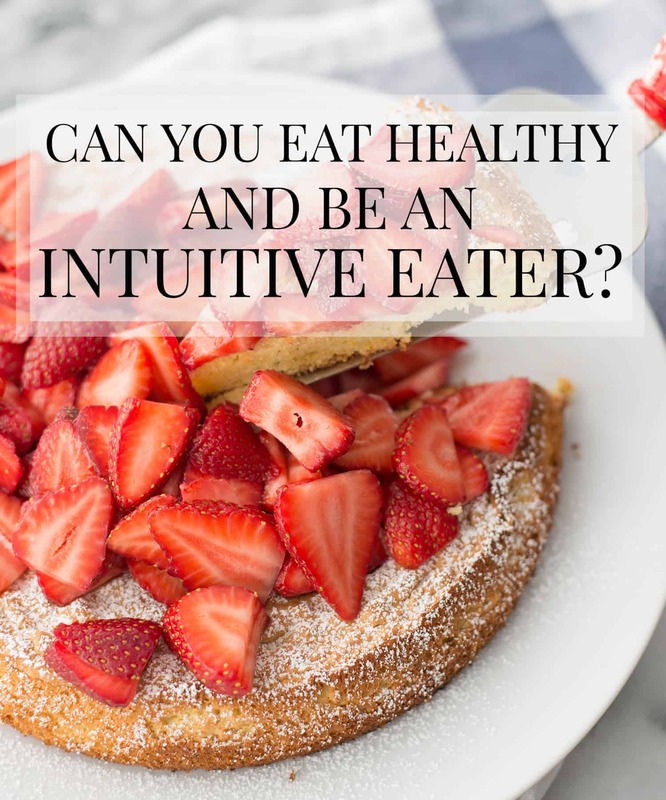 Can you eat healthy AND be an intuitive eater? This is a conversation I have at least a few times weekly with my clients. One they often bring up in the discussion of intuitive eating. Is it possible to be an intuitive and conscientious eater? If you aren’t familiar with the concept of intuitive eating, I like to call it ‘eating like a two-year-old does.’ In a simplistic nutshell, you choose foods that sound best to you, eat when you are hungry and stop when you are full. 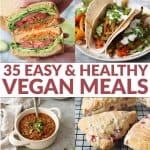 I know this sounds like a duh moment, but most of us don’t eat this way. We choose foods based on labels and nutrient content, often eat when we aren’t hungry and ignore signs of fullness. I often call intuitive eating unlearning how to eat. At some point, we were all intuitive eaters and things got lost along the way. However, while intuitive eating gives permission to eat all foods, it doesn’t mean that you have to. Look. I love desserts as much as the next gal, with fro-yo, vanilla anything and lemon bars topping my list. I also know that if I eat those foods too often, I don’t feel so great. That’s not a decision based on calories, it’s based on what I know to be true of myself and also nutrient content. I have the permission to eat these foods whenever I want; it’s my decision on when that happens. As a dietitian and food-science nerd, I also know that not all foods are created equal. I don’t have a problem with partially-hydrogenated fats because of their lipid content, but because of the research that links them to heart disease. So, I label shop. I turn over jars of peanut butter to check and see if these fats are in. If they are, I put them back and choose another brand. While both dessert and trans fats are allowable foods, I choose not to eat them often for varying reasons. Does eating this way make you less of an intuitive eater? No. I call it choosy intuitive eating. I choose foods that I love to eat, but it’s often through my nutrition lens. I love peanut butter, always have, always will. I’m still enjoying that food, but I’m choosing a brand that also aligns with my nutrition beliefs. And, if I’m out somewhere and offered peanut butter with partially-hydrogenated fats, I’ll still eat it. I know that a little bit isn’t going to harm me or send me to a cardiologist, but it’s not a product I choose to bring into my home for everyday eats. Just like the dessert example above. When my sweet tooth comes out (and some days it’s stronger than others), I listen to that sweet tooth. I know that sugar isn’t a food that’s giving my body essential nutrients. However, I also know that enjoying a donut when I crave it or an ice cream cone on a hot summer day isn’t going to increase my risk of cancer, diabetes, insulin dependence or fill-in-the-blank. Why? Because above all else, patterns matter. It’s the foods that you choose to eat day-in and day-out that have the largest impact on overall health. I had gelato daily on our recent trip to Spain and I’m 100% OK with that. I feel zero guilt in that decision, as it’s vacation, it was pretty incredible gelato, and I know that my normal eating patters are very different when I’m back home. Intuitive eating works because while I love my ice cream cones, I don’t eat them every day. Most of the time, I don’t even eat them every week. It’s not because I can’t or that I restrict my intake, but because I prefer other foods more often. I listen to how my body feels after certain meals and snacks. I feel most energized after a salad, a grain bowl, or a slice of avocado toast. These are the foods I gravitate towards because I want to, not because I have to. When the craving strikes for an ice cream cone, I will often eat it. Because I know that I can have whatever I want. Hunger and cravings are permission; that’s the cornerstone of intuitive eating. I don’t stress over the sugar content of an ice cream cone a few times a month because in the grand scheme of life patterns, it doesn’t matter. It’s a simple approach to balance that never has to actually utter the word. Being a choosy intuitive eater allows me to fill my plate most of the time with foods that feel good while still enjoying less nutrient-dense fare. You can have it both ways. You can be an intuitive eater and be a conscientious eater. I think there is a general misunderstanding that intuitive eating means you’ll eat your favorite foods all the time; with favorite being a stand-in for less nutrient-dense. You won’t. Well, you may for a little while but it usually evens out after a few weeks when you start to intuitively listen to not only your hunger, but how you feel. And the end of the day, intent still matters. Like I tell my clients, I’m OK if you don’t want to eat the cupcake, I’m not OK if you’re scared of what the cupcake will do to you. Those are different. Choosing to not eat something is part of intuitive eating, setting up fearful thoughts around food isn’t. I love your concept of choosy intuitive eating!! It’s the perfect way of describing gentle nutrition. If someone is stuck in the diet mindset, they’re not paying attention to how foods make them feel presently, only about what they’ll “do to their body” in the future. Once you give yourself permission to eat whatever you want, your body is smart enough to know that it needs nutrient dense foods! Beautiful advice! This is information that is helpful to people of all ages. Thank you. Important advice, and I’m passing it along. I think you bring up a great point about choosing foods through your “nutrition lens”. 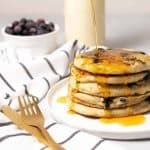 I love the Intuitive Eating approach and it’s completely changed the way I practice. However something I’ve been thinking about lately is how much easier it likely is for dietitians to eat intuitively and nutritiously without even thinking about it. We already having pre-existing nutrition knowledge that probably floats around and is used in many of our food decisions (regardless if we notice). Would love to hear your thoughts on this if you have any to add! Thanks for a great post! Great insight Leanne and you’re right; there are probably natural ways that we choose food because of our background and training, habits that are so ingrained, we might not even notice the difference. When I work with clients, I try to merge both of these ideas. I love the principles behind IE and think they resonate so much with those of us who are tired of diets. And, in the same breath, there are nutrition dogmas that I believe are important to overall health and quality of life and try to advocate those as well. I do believe there is a way to do both; to learn what foods make you feel good, to listen more to your internal cues of hunger and fullness, and work towards changing habits so that these decisions become easier with time.